Himachal Pradesh is an area, comfortably cuddled in the midst of the Himalayas, parading an ethereal wonder that will abandon you besotted forever. With this six-day visit, start a relationship with nature herself, as you visit Dalhousie, Dharamshala and Khajjiar. All these slope stations are hung in thick coniferous and oak trees, with the undulating mountains shining in the setting. The groups of interesting houses dabbing the verdant inclines and the clearing perspectives of the encompassing will leave an unceasing impact on your heart. Day’s excursion to Khajjiar - Dharamsala. visit the Jyotirlinga of Baijnath templeCamera fee. 4.35% GST (includes 0.15% Swachh Bharat Cess). vehicle mal-functions, political disturbances etc. You will be picked up from Chandigarh/Pathankot and will be transferred to Dalhousie by road. Upon arrival at Dalhousie, check in at the hotel and relax. In the evening, you are free to unwind and enjoy an overnight stay at the hotel in Dalhousie. After a wholesome breakfast, visit Satdhara or seven springs, Martyr’s Memorial at Panchpula and Subhash Baoli. Later head back to the hotel and in the evening enjoy the bustling Mall Road. Overnight stay will be arranged at the hotel. After a yummy breakfast, check out from the hotel and drive to Khajjiar by road. Enroute visit Dainkund, Khajjiar Sanctuary, Gandhi Chowk and Khajinag Temple. Arrive at Khajjiar, check in at the hotel and spend the rest of the day at ease. Overnight stay will be arranged at the hotel. After a wholesome breakfast, check out from the hotel and drive to the beautiful hill station of Dharamshala. Here you can easily access the snowline and go on a day’s trek to a snow-point. 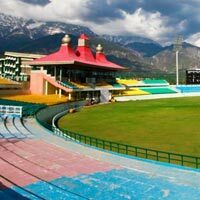 Once you arrive at Dharamshala, check in at the hotel and spend the rest of the day for leisure and overnight stay at the hotel. After a yummy breakfast, visit the Jyotirlinga of Baijnath temple and also visit the Tibetan monastery in McLeod Ganj. Later, visit Palampur Tea Estates and then come back to hotel to rest for the day. You can also take a stroll at Mall Road in the evening before heading back to your hotel for the night. After a delicious breakfast, check out from the hotel and drive to Chakkibank/Pathankot/Chandigarh for your onward journey.